Even when an older home is being totally renovated I believe there are lessons to learn from its history. Retaining even a small acknowledgment of its past can add a sense of authenticity to the new version. When Michelle and Jeff came to me for a kitchen renovation for their mid-town 1930s home they actually wanted the new kitchen to reflect the home’s vintage. 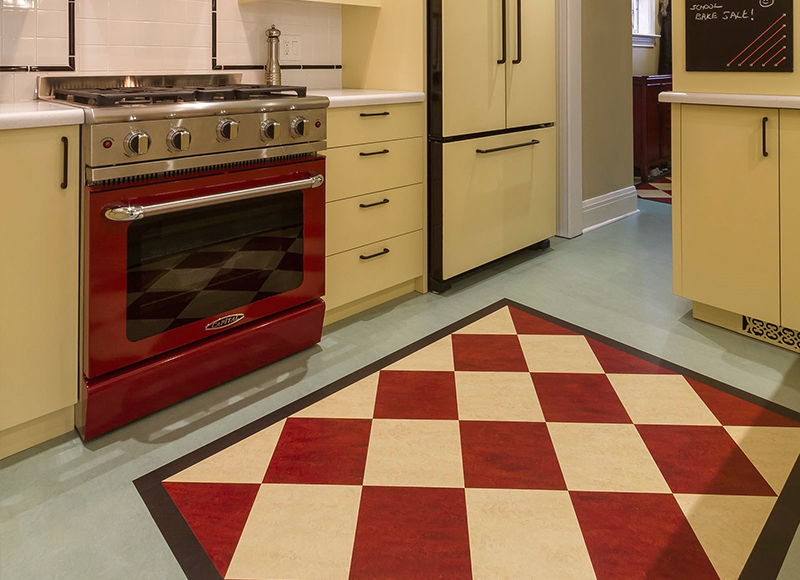 We had agreed to use colours of the era but I dug around for something extra to incorporate and discovered the linoleum rugs that were popular at the time. I used the concept for the kitchen floor and front hallway, designing a “rug” from a combination of tile and sheet Marmoleum, in the colour palette we had chosen. It adds an extra pop of colour, and an unexpected nod to the vintage of the house.